Sen. Everett Dirksen: “Stop your belly-aching”. 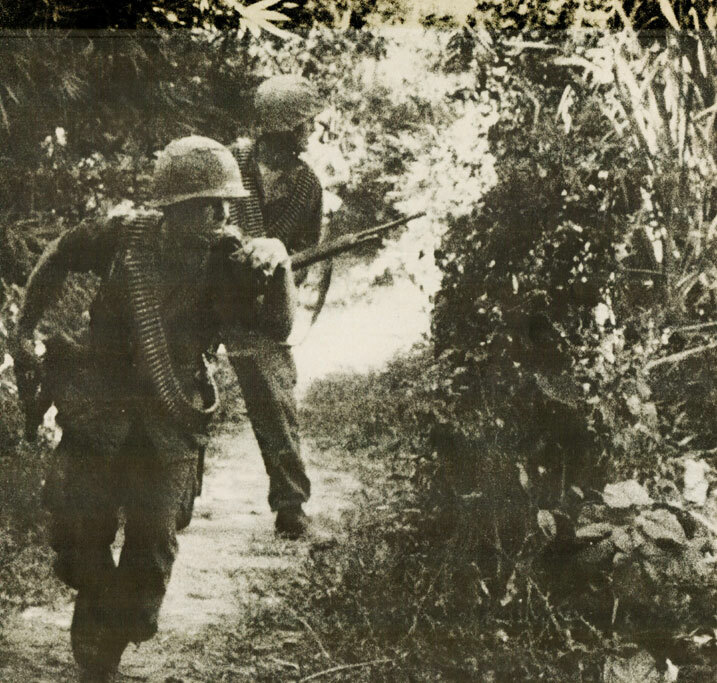 As the casualty count continued to rise during the ongoing battle at Con Thien, this September 26th in 1967, the ever-widening gap of opinions over what to do about the Vietnam war took a hostile turn. On the floor of the Senate, Senator Clifford P. Case (R-New Jersey) was roundly rebuked by colleagues and allies alike for stating President Johnson was in the process of violating the Gulf of Tonkin resolution. Labelled a Dove, Case was accused of “aiding the enemy” by Hawk elements in the Senate, and even Case’s party leader, Senator Everett Dirksen told Case to “quit belly-aching” about the Vietnam War. Meanwhile, in Vietnam the battle at Con Thien was reportedly over, but news as to what actually happened was murky and loaded with gaudy superlatives. Called “The fiercest fighting since Iwo Jima” and “an attempt at Dien Bien Phu” (the 1954 battle which cost France the loss of Vietnam and our subsequent involvement), the news was blindly upbeat over the staggering losses of North Vietnamese forces and how this was the most significant battle of the Vietnam War. There were now calls from the Defense Department for massive bombings of North Vietnam, including civilian centers and a general escalation in our troop levels. And as the mainstream news machine put it (even in 1967) – this was possibly a telling climax to the War. Trouble was, back home – people were starting to not buy it. And the scene on the Senate floor was only a small indication as to what was brewing around the rest of the country. Try as they might to paint an upbeat picture of the war, things didn’t add up, and the victories and low casualty count on the part of U.s. troops just didn’t seem to make much sense. Even this newscast via NBC Radio’s News Of The World, seemed to ring hollow – as though an attempt had been made to portray the Vietnam War as an extension of World War 2 and it just wasn’t coming off. In other news – there was The Great Tax Battle of 1967 going on, with calls for a slash in spending for non–military projects and an anticipated fight with Republicans over an LBJ call for a 10% increase in Income taxes. And flood damage was still going on in Texas with waters from the Rio Grande rising and threatening a Tuberculosis Hospital. Floods were expected to reach Brownsville Texas within days. And a mass poisoning in Tijuana, Mexico had people baffled as to its cause. The victims, mostly children came down with a mysterious illness after eating bread and milk. So far, 13 people had died as the result of the poisoning. And that’s a small portion of what went on this September 26th in 1967, as reported by NBC Radio’s News Of The World with Morgan Beatty. While the much-fabled Woodstock Festival was getting underway for its first day, the world was spinning wildly away as usual on this August 15th in 1969. From Northern Ireland, Catholic and Protestant rioting was raging on. British troops were being reinforced and rioting was spreading rapidly. In Vietnam the story was pretty much status-quo – no lights, not even of freight trains, at the end of the tunnel. However, news of a Freight Train moving across the country carrying World War 1 vintage poison gas had people along the route concerned. Since this edition of the news came from a local California station, KSRO in Santa Rosa, there was news of goings on locally. Governor Reagan was figuring in prominently with yet more mental health facilities facing closure. College students were faced with instant expulsion if they were suspected of disrupting classes. And the grisly investigation of the Sharon Tate murders was continuing. No mention of Woodstock though – on this day in 1969 it wasn’t even news at the time. But the rest of the world went on as usual, this August 15, 1969. The wave of paranoia had a certain cachè of validity attached to it. It probably shouldn’t come as a surprise to many that our preoccupation with Domestic spying has been with us for a very long time. In 1970 it was becoming a problem largely due to the amount of data the FBI and the Military were gathering on just plain Americans who happened to protest the Vietnam War. But it never really stopped there. Before 1970 it was Communists and the whole McCarthy/Red Scare/Paranoia of domestic terrorists tossing bombs at office buildings and water purification plants. So to what extent did this domestic surveillance of U.S. citizens go to? Everybody, it seemed, had some sort of files. Phones were routinely bugged, “interested parties” were routinely followed. The military had spies dressed as students gathering information on the comings and goings of Student leaders and anyone else deemed important. But that was all before the age of Computers and Social Media and the Internet and stored passwords and on-line banking. Yes, things were a lot simpler in 1970 and spying was infinitely less sophisticated than it is today. But it still existed. In 1970, as part of their monthly news program, First Tuesday, NBC ran a documentary on the status of Domestic Spying and why was the Military getting involved? Scary stuff, particularly if you were living in those times and protesting “that” war. So to let you know that the latest sets of revelations about our ability to spy on each other isn’t really all that new a concept, here is that 1970 documentary, giving you the rundown at the time as to how it was done and who was doing it. Hard to imagine what we would have thought if we knew we’d eventually have drones to deal with. Scary times then – harrowing times now. The deadly game of Tag: You’re It. News reports on the war in Vietnam were coming with such regularity in 1965 as to almost make the news humdrum and monotonous. So the news for this July 18th in 1965 focused primarily on the upcoming Mayoral elections in New York. Since this broadcast came from WOR, it would only be natural to focus on the issues confronting the local population. But the Vietnam War was starting to get on peoples’ nerves. There was still the very vocal support of it via the Hawks who commandeered the airwaves and reported casualty figures that exaggerated Vietcong losses while minimizing our own. But as the year dragged on, that support became less and less vocal and more and more questioning. And the body bags kept on coming. On this day in 1965, the news was about the only highway between Saigon and the sea being cut in two by Vietcong and that battles were going on all over South Vietnam. Reports from a visiting Defense Secretary, Robert McNamara, giving an upbeat assessment of the War, was expected to return to Washington later on in the week to ask for a dramatic increase in troops and support for the war effort. The Cruise ship 7 Seas was stranded some 500 miles off the coast of Newfoundland, owing to a fire in the engine room which cut power on the Rotterdam to New York bound passenger ship. Tugs were being dispatched to the stricken ship, which carried some 400 passengers, to the nearest port, St. Johns in Newfoundland. Civil Rights news for this day covered the latest set of marches in Louisiana and the violence that confronted the protestors. President Johnson and the First Lady were flying to Illinois for the funeral of Adlai Stevenson, who passed away earlier in the week. Renewed violence in the Middle East with reports and allegations of Syrian Army troops opening fire on Israeli farmers along the Sea of Galilee with Israeli troops returning fire. So that, and lot of other local and International news was what went on this particular July 18th in 1965 as reported by WOR-AM in New York. We’re still fundraising – no new donations yet today, so we really need any help we can get. Click on the link here – Past Daily Summer Fundraiser – to make a donation in any amount. It’s badly needed and the support is very much appreciated.